Click here to see the operations of the business. If your fabric is wearing or just out of style, it is usually less expensive to reupholster than to replace high quality furniture. We have mastered the art of upholstery. I have been doing upholstery for 28 years in Staunton, VA and Augusta County. I have a Masters in Upholstery and have taught upholstery classes for one of the local colleges here in Staunton as a vocational class. I worked in Hickory, NC where I received my training as a sample builder of furniture. I built some of the french chairs that sit at our Capital while working at one of the 10 factories in Hickory, NC. We pride ourselves in doing Quality work, and that is the reason we have been in business for so long. Our customers come first. 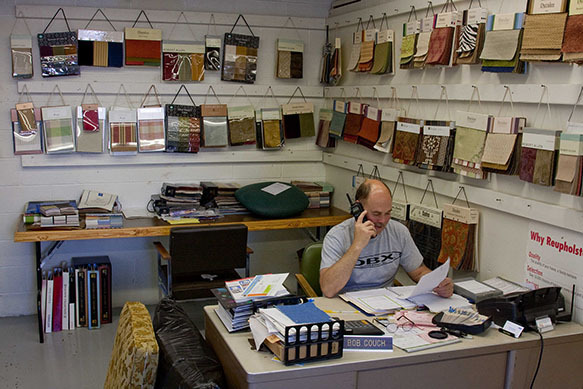 We sell leather, THE BEST FOAM AND ALL SUPPLIES.